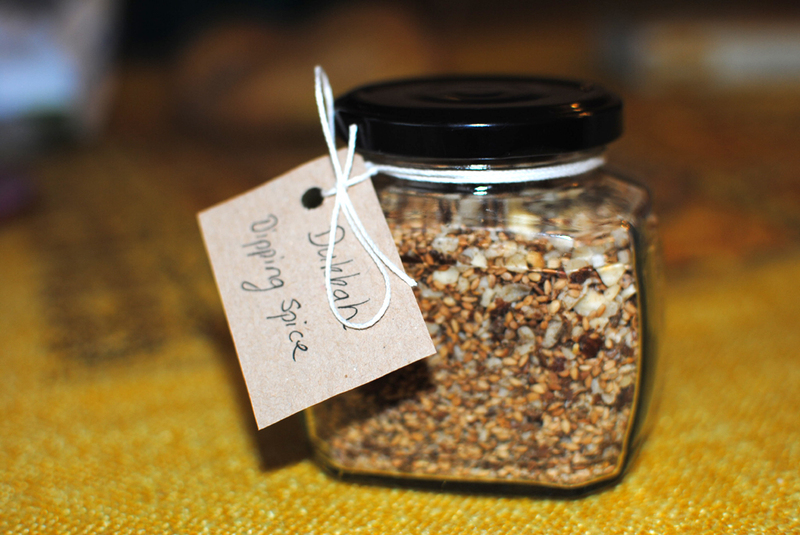 Dukkah (aka Dugga or Dukka) is an Egyptian spice mix and it is delicious! I can't remember when I first came across it but it was somewhere in Australia. A short while ago I had some dry-roasted sesame seeds left over and I was wondering if there was something interesting I could do with them. Floating around in the back of my brain was this spice mix. I couldn't quite remember the name of it or the precise ingredients but a short look via google and I knew Dukkah was it. Luckily enough I had the right ingredients on hand and quickly whipped up a batch. As I had already toasted the sesame seeds and I'm lazy I didn't toast any of the other ingredients but just crushed them and mixed them all together. I was a bit worried that it would taste too "raw" but it was yum! I do recommend making sure you toast the sesame seeds though as their flavour changes for the better after toasting. After finishing off that batch I thought it would make a perfect gift for a friend. Dukkah is traditionally used as dipping spice. Take some fresh bread (turkish is great) dip into some olive oil (Extra virgin of course!) then dip into the spice mix and enjoy the flavour explosion. I don't think it should be limited to a dipping spice for bread though and I've used it as a great addition to roast brusselsprouts and eggplant, and I've added it to salad wraps. I'm sure it would be great on loads of vegies and I've heard it's tasty on boiled eggs too. Makes enough for around two jars -for you and a friend! This is a recipe which you can really taste and adjust to your liking and the quantities here are just a guide. 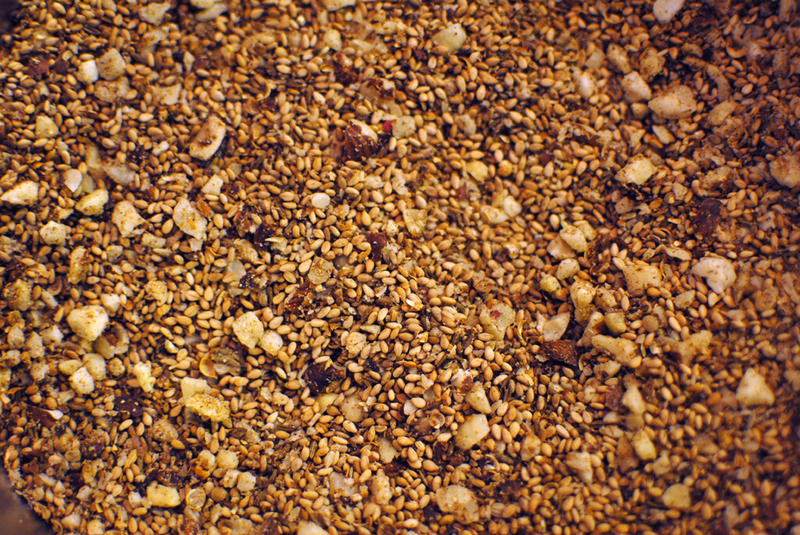 Toast the sesame seeds in a hot dry fry-pan until light brown. Set aside. Toast the hazelnuts, peppercorns, coriander and cumin seeds for about two minutes. Combine all the ingredients and pulse in a food processor until combined and fine. Don't pulverise them to a paste, it should still be a coarse powder. 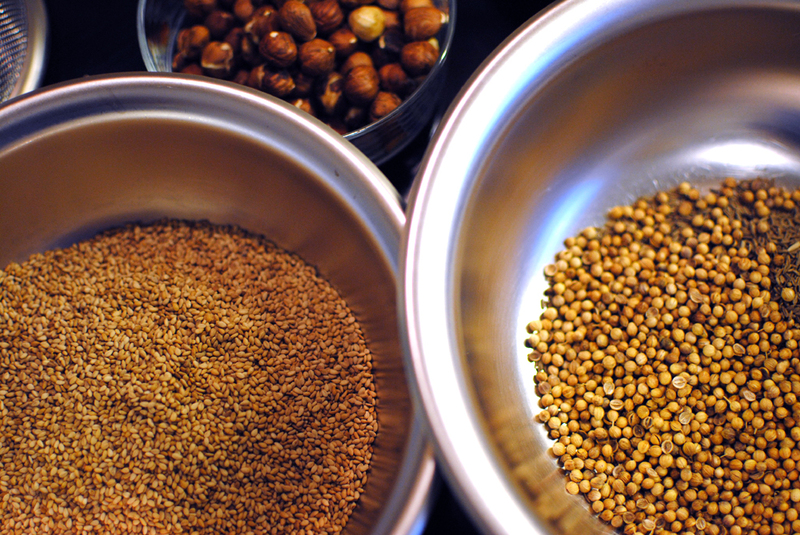 Or smash the hazelnuts, cumin, coriander and peppercorns with a pestle and mortar and then combine all the ingredients. Put into a pretty jar and enjoy!